BURBANK, Calif. – June 6, 2011 – Fans attending Disney's D23 Expo (August 19-21, 2011) will have access to an exclusive advance screening of "THE LION KING" in Disney Digital 3D, ahead of the film's highly anticipated theatrical and home entertainment releases, The Walt Disney Studios announced today. The screening will be held August 20 at the Anaheim Convention Center in Anaheim, Calif. The Circle of Life takes on a new dimension as Simba, Mufasa, Nala, Timon and Pumbaa grace the screen once again, this time in breathtaking 3D. Beginning Sept. 16, a special two-week theatrical extravaganza will showcase the Oscar®- and Golden Globe®-winning film on the big screen in Disney Digital 3D for the first time ever, followed up by the home entertainment debut Oct. 4, celebrating the Diamond Edition release of the epic movie "THE LION KING" in high-definition Blu-ray and Blu-ray 3D. 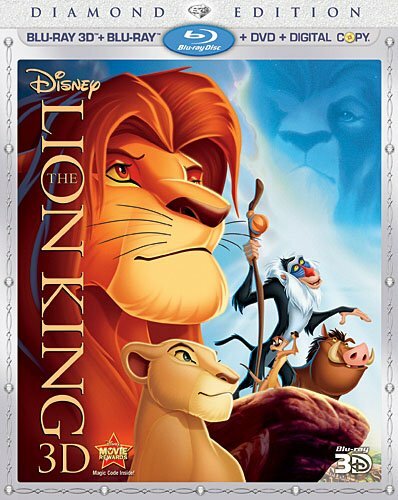 Released in 1994, "THE LION KING" remains one of the most successful animated films of all time. The classic tale of the African savanna wowed audiences worldwide with spectacular hand-drawn animation along with inspiring songs by Sir Elton John and Tim Rice, plus an evocative score by renowned composer Hans Zimmer. Three years later, the landmark film was adapted into a Tony Award®-winning musical, becoming an instant hit on Broadway, where earlier this year it became the seventh longest-running show ever. Winning over 70 major awards, it has delighted more than 55 million theatergoers around the globe. The D23 Expo—The Ultimate Disney Fan Event—brings the entire world of Disney under one roof, providing attendees with unprecedented access to Disney films, television and theme parks as never before. Tickets for the D23 Expo 2011 fall into three different pricing tiers, based on purchase date (visit www.D23Expo.com for details), and D23 Members can enjoy additional savings plus members-only benefits. Multi-day money-saving tickets are also available for both D23 Members and the general public. The name "D23" pays homage to the exciting journey that began in 1923 when Walt Disney opened his fledgling studio in Hollywood. D23 is the first official community for fans in Disney's 88-year history. D23 gives its members a greater connection to the entire world of Disney by placing them in the middle of the magic through its quarterly publication Disney twenty-three; a rich website at www.disney.com/D23; a new collectibles line, the Walt Disney Archives Collection; and special events for D23 Members throughout the year, highlighted by the D23 Expo in Anaheim, California, August 19-21, 2011. Fans can join D23 at www.Disney.com/D23, all Disney Store locations within the United States, select shops at Disneyland Resort and Walt Disney World Resort and at www.DisneyStore.com/D23. To keep up with all the latest D23 news and events, follow "DisneyD23" at Twitter and on Facebook.